The photo above is my attempt at a hockey stick. Well ok, not really. It's a Canadian boomerang! No, ok seriously, it's the edge of the dash. I noticed the other day that it hadn't been done. It is mostly hidden behind a door that has been open pretty much since I put it on. It'll be nice to see it finished at last. There's another piece angling down from this as well I still need to make. While I was being creative with the router, I put together the ends for the booshelf that will grace the top of Gena's desk. It needed an interesting shape and I think this is pretty interesting. The big hump is where a gate ( or bar ) will go across to stop the books from falling out every time we go on a starboard tack. 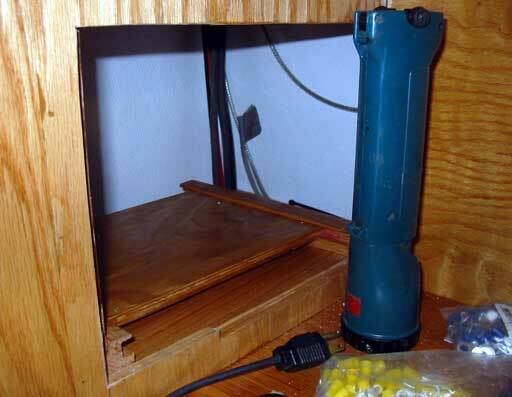 Because Gena wants her ham radio and gear built into the desk under the tambour part, the radios must be mounted in a way that the brackets can be accessed and so can the back of the radio. The only way the achieve this is to put the whole mess on a sliding table. Care had to be taken that the table isn't too tight as wood swells some when in a moist atmosphere. If it is too loose, it will clunk around as the boat moves. Right now it's fairly easy to move as I waxed the tracks well! 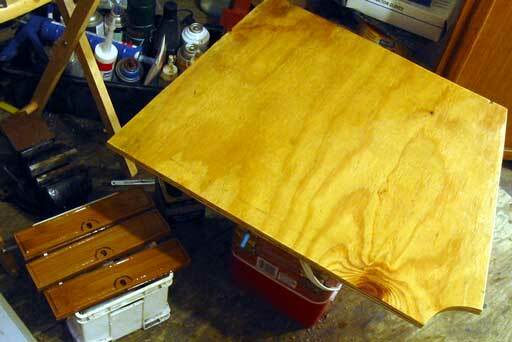 For the little cabinets along the top of Gena's desk, I decided to use some leftover bamboo flooring for the doors. They are pretty small so these are perfect! Notice the routed design. The round part ( done freehand very carefully!) will cup the brass knobs. 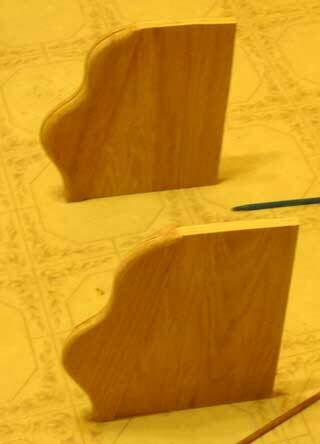 They have been routed similarly to the cabinet doors and drawers I have done already. Luckily I have guarded all the springs and parts along with my dremel bits in a heavy plastic bag all this time, so it'll be easy to make the latches. The photo to the right above is a shelf for my desk, the one below it shows the finished radio mount in place. 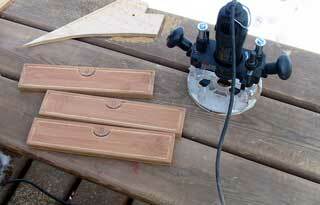 Some oak screen window moldings will hide the scrappy edges. 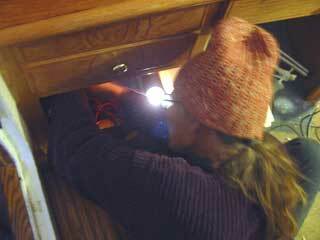 Gena got busy with the aft electrical panel. 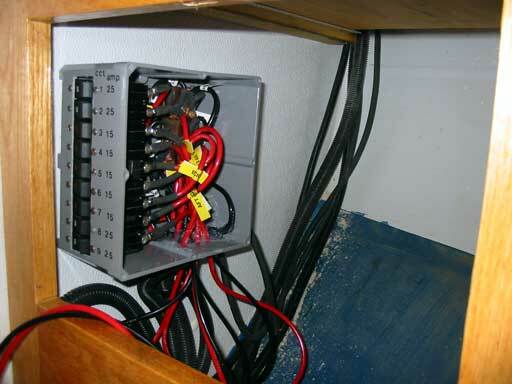 This breaker panel powers everything aft of the pilothouse aft bulkhead pretty much, and is also mounted in her desk. We were of course tripping over each other all day as I made measurements and she crawled around under it. Bad planning! It's a pretty tight spot, but we just couldn't think of anywhere else. The WeFax machine takes up the only other place it could have been mounted. Now it's all done, it can be hidden away behind a door, just like the one in my desk. Nice job! 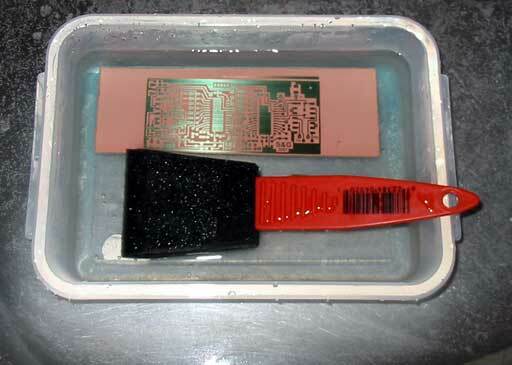 As if all this isn't enough, I waited until it got dark and went out to expose another PC board for photo etching. 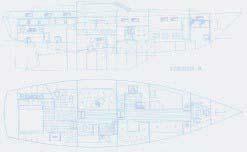 I have always enjoyed the use of our old laser printer at work because it has no problem with transparencies. Now we no longer own the business (yay!) I must either take a paper copy into a photocopy place and have it done, or try to find a way to do it at home. It turned out my $49 Lexmark did a better looking, crisper transparency than that laser thingy. And crispness is important with fine circuitry. 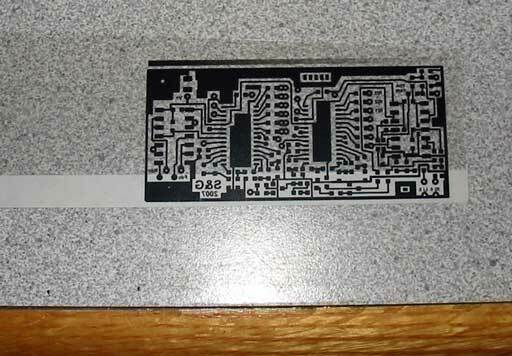 This board is only 3" long. After it was done, I must say it's the best board that's ever come out of the etchant around here! It's one of 2 for the tiny stereo system I am making for the dining area. More on that here, if you're electronically inclined. 12 hours total: Made bookshelf ends, radio slide, cabinet doors, shelf, and dash edge. Installed breaker panel aft.